For some reason, inexplicable to me, sport assumes a great importance in my life and millions of fellow sports addicts. In my case it is football and cricket that are responsible – depending on which way you look at it – for me wasting or enjoying thousands of hours of my life either playing, watching or officiating (I qualified as a cricket umpire two years ago). Rich pickings: Are true fans being priced out of football? Followers love the excitement of their chosen sport and there is nothing like the banter in the pub or workplace (or both if you happen to be the landlord) after a controversial event or match. In these difficult economic times sport assumes an even greater importance in enabling people to escape to a place where the grass is greener and where your favourite team or sports star is keeping you on the edge of your seat. That is, of course, unless you want to watch the event live. 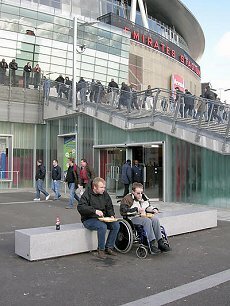 The cost of attending live sports events is becoming increasingly prohibitive to a growing majority of already dispossessed people in the UK; fancy getting a season ticket at Arsenal (to name but one of many Premier League football clubs)? Don’t expect too much change from a grand. Want to spend an enjoyable day in the sunshine at Lord’s this summer to watch the England-South Africa cricket Test or England-Australia one-day international? That’ll be £128 or £160 please. And let’s not even go near the price of attending F1 Grand Prix, and dare I say in this season of sporting nationalism, some of the Olympic events (and that’s if you are lucky enough to get through the Stasi-like application process online). As in all these situations, the first past the finishing post of nabbing the best seats in the grandstand are our old friends the corporates who treat their clients and suppliers to the sounds of munching of canapes and gentle clinking of champagne glasses while the rest of us slump in front of a TV (and if you don’t have SkySports at around £25 a month then even that is not an option). I can live with upper-class toffs strutting around Henley or Ascot – these genial annual bashes are part and parcel of the sporting calendar and take us back to an era of debs, bounders and tiffin. But to see our mass spectator sports acquiescing without a fight to the power of big business is truly sickening. And though I really hate to hanker on about ‘the old days’ (at my age there is more to look back on than forward to), I can remember a time, not so long ago, that a day at a Test match and entry to watch Arsenal would set you back about a tenner, or even a fiver. A time when the stadia were heaving with people appreciating the finer points of their sport rather than the current crop of corporate hangers-on. A time when supporting your local club or sport meant something more than a physical presence. And a time when the greed of fat cats was confined to Ascot.